A seminal event in modern Irish history was the Easter Rising of 1916. In that year a group organized by the Irish Republican Brotherhood, a secret society dedicated to Irish independence, seized several blocks of the Dublin city center on Easter Monday and proclaimed a Provisional Irish Republic. The Easter Rising was originally scheduled for Easter Sunday itself, but was postponed until Easter Monday, which in 1916 was April 24. All the same, the association of this event with “Easter” has stuck, both in its name and in its connotation of “blood sacrifice” and “redemption,” and it is usually commemorated on Easter, whenever that holiday falls in a particular year. 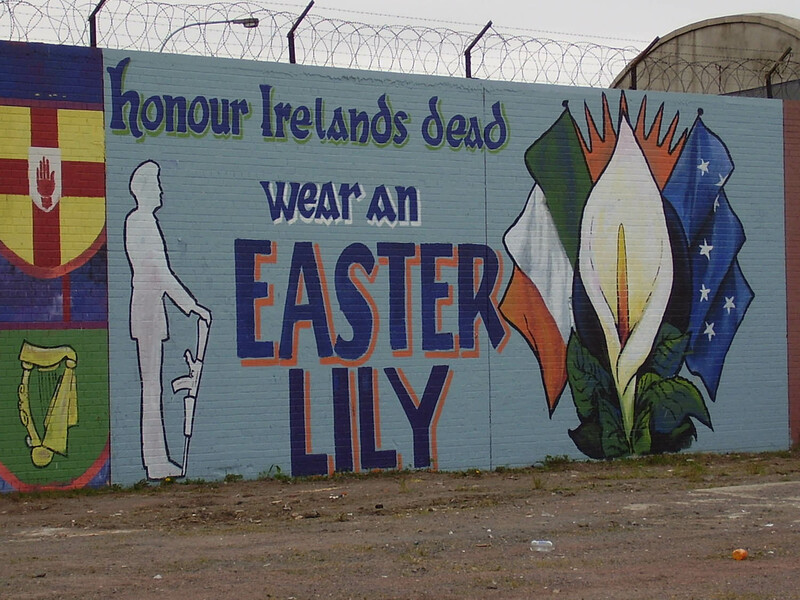 Easter lilies, therefore, are not purely religious symbols in Ireland: to wear one proclaims your support for Irish republicanism and the honoring of republican martyrs. Republican Mural on Mountpottinger Road, Belfast. From the University of Ulster’s CAIN (Conflict Archive on the Internet) Web Service. 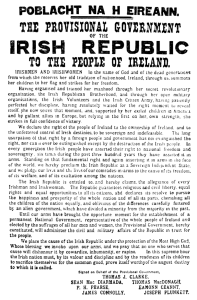 I have not been able to find much information on how or even if the Easter Rising was celebrated by the Free State – presumably it was (the Free State flew the republican tricolor, after all), even though a lot of people saw the Free State as a betrayal of the ideals of 1916. The Irish government (now republican) certainly celebrated the fiftieth anniversary in 1966, an event that left an impression on people at the time. The timing of the 50th anniversary of the Easter Rising was significant. As taoiseach, Seán Lemass was anxious to secure Ireland’s future within the European Economic Community (EEC) and had attempted to improve relations with both Britain and Northern Ireland. He constantly brought to the fore images and references to ‘modern’ Ireland so that the fiftieth anniversary commemoration was as much about the act of looking forwards as backwards, requiring a delicate negotiation between tradition and change. Nowhere was this more apparent than in how the commemoration was communicated to the youth of Ireland, a group which represented the nation’s future but which had mixed reactions to the lessons of the past. The main Easter Sunday State Commemoration Ceremony for the 100th anniversary of the 1916 Rising took place in Dublin city centre today. The principal Easter Sunday State Commemoration Ceremony and Parade started at 10am with a reading of the 1916 Proclamation of the Irish Republic. Hundreds of thousands of people lined the streets of Dublin for the largest public spectacle in the history of the State. Wreath-laying ceremonies followed at Glasnevin Cemetery and at the Stonebreakers’ Yard in Kilmainham Gaol. The parade then made its way from St Stephen’s Green to College Green, stopping off at Dublin Castle. 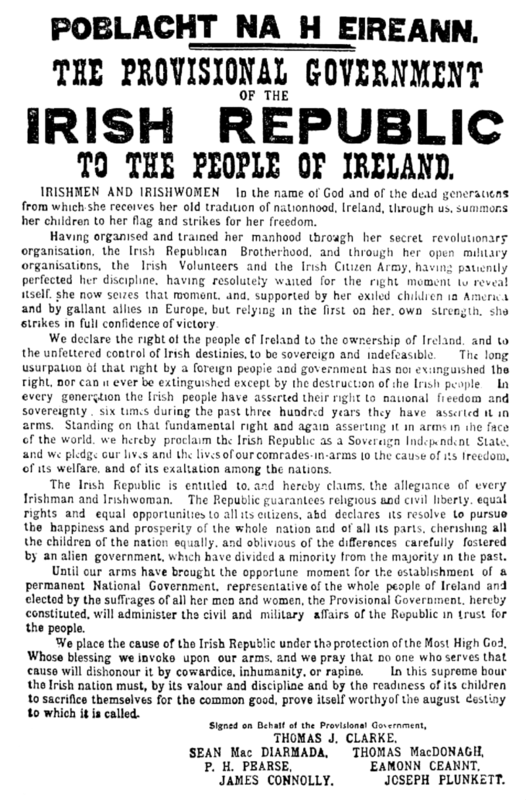 At midday, the Proclamation of the Irish Republic was read aloud at the GPO by Captain Peter Kelleher, followed by the Military Band playing Mise Éire. Acting Taoiseach Enda Kenny told the gathered crowds the State honoured the memory of those who died in 1916 with the respect and the dignity that is their due. The Irish flag was lowered to half mast during the event and President Michael D Higgins laid a wreath to honour all those who died. These are noble sentiments, indeed, and fairly novel ones when commemorating the Easter Rising. The House of Commons and the Quebec and Ontario legislatures adopted resolutions backing Irish self-government in the late 1800s. Liberal opposition leader Edward Blake, who had been Ontario’s premier in the 1870s, left Canada to take up the cause of Home Rule for Ireland by serving in the British House of Commons as the Nationalist MP for South Longford, in the Irish midlands. Ottawa Liberal MP Charles Ramsay Devlin, a former trade commissioner, left the government of prime minister Wilfrid Laurier to serve in Westminster as a the Nationalist MP for Galway. Devlin ended up becoming secretary-general of the United Irish League in 1903-06. Blake and Devlin are probably not that significant (as mentioned, these IPP types were completely eclipsed by the events of 1916), but it’s good to remember the “international” aspect of the British Empire, whereby a political career in a colony could serve as prelude to a political career in the metropole (or in another colony, according to your point of view) – and that there was sympathy for Irish independence, and not just for unionism, in nineteenth-century Canada. This entry was posted in Anniversaries, Canada, Ireland, Nineteenth Century, Politics, Religion, Twentieth Century by jgood. Bookmark the permalink.